Netflix (via EW) has debuted the first Stranger Things Season 2 photo and revealed that the new season will have a Super Bowl spot this Sunday! In the gallery below, you can check out a photo from the ad in which Dustin (Gaten Matarazzo), Mike (Finn Wolfhard), and Lucas (Caleb McLaughlin) are dressed as Ghostbusters. Stranger Things Season 2 will consist of 9 episodes set in 1984. Matt Duffer and Ross Duffer (Wayward Pines, Hidden) serve as writer, directors and co-showrunners of the series, and are executive producers along with Shawn Levy and Dan Cohen via their 21 Laps entertainment banner (The Spectacular Now, Night at the Museum, Real Steel, Date Night). 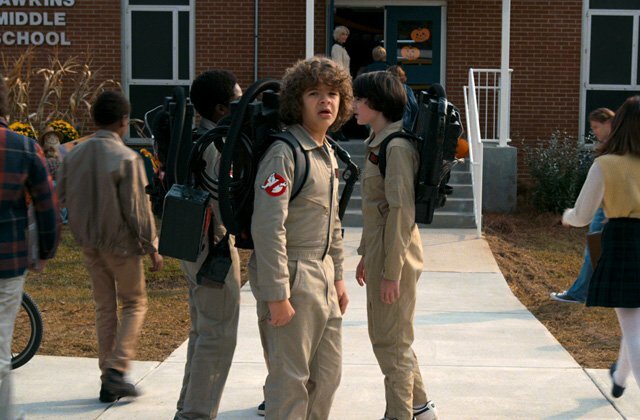 What do you think of the first Stranger Things Season 2 photo? Let us know in the comments below!